Today's Bloggers Challenge is Gifts....For my challenge I created a Flip Book perfect for your holiday photos, using SU's Ski Slope Designer Papers. I used my JustRite C-30 Stamper (soon to be renamed Luxe Stamper) and my Small Letter Set to create the sentiment with the date. If you'd like to play along with this weeks challenge - simply leave a link on this blog post, or if uploading to SCS use Keyword BC70. Looking for inspiration - check out what the other players have created this week. Be sure to check out my JustRite Blog Candy! 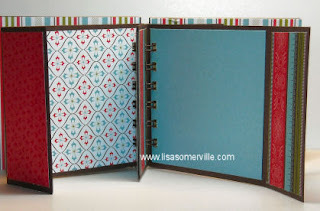 My Flip Book Tutorial can be found here. Very awesome...that paper is perfect for the flip book! That is just wonderful, Lisa!!! The paper is a perfect choice for a great flip book! Wow Lisa! This is just gorgeous! I love what you did, and NEED to get a binding machine. LOL Awesome.. This is gorgeous. I guess I need to pull my Bind It All out and start playing. Got to hand it to the BIA, it makes these things easy. This is such a beautiful gift. I love this Flip Book! What an awesome idea for a gift, and could be personalized! Beautiful DSP! Great gift idea, Lisa. That is the perfect paper for a holiday album! 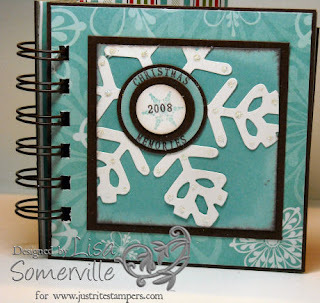 I love the paper on the book and the snowflake die is just perfect on it - awesome! Super Nice! Love the paper (I need to get that one) and what a great way to display photos. Great project for the challenge, Lisa! I love the flip books! I feel a case coming on! Love this. All the projects you have done this week are wonderful, I have seen but had not had time to comment. I need to check them out again. Great job, you should be ready for Christmas soon at this rate. What a terrific gift this will make. Great book. I love it! Beautiful!!! Can't wait to start using my snowflake die..thanks for the inspiration!